The 2127 is a "Long Egg Vase" which was previously number 623 - so yes that one is something made during the years Crown Lynn ran the Titian factory. 736...cant say for sure - the colour looks right and it is described as a butter pat - which yours seems to be but I have no pic or sketch to prove it. The dish 735 is a fluted small dish. .20 - dont think so, doesnt fit with anything I have unless it was in the hand modeled pieces which I doubt. Glad to see you are still about collecting! We do have a pic of the 736 butter dish and it's just a plain little dish unlike John's pretty piece. I'm going to start a topic about all of the pieces numbered like Crown Lynn - that is with dots before and after the number that don't fit into the Shapes Gallery. 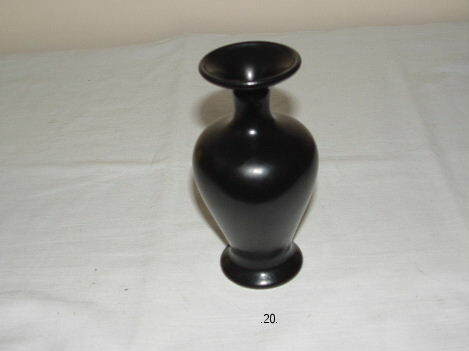 John has sent in many over the years and I will add the black 20 vase to it to see if the shapes tell us something that we haven't noticed before. Edits: The 623 had a measurement of 8 and 5/8 and I must add that I would never have recognised the glazing as being Crown Lynn on that piece!